Visionary iGaming is a software provider that has been providing live dealer games to online casinos since 2008. Today, Visionary iGaming is active in the North American, European, Asian and Latin American markets with more than 100 employees serving more than 40 casino sites around the world. The company headquarters and live studio are based in San Jose, Costa Rica and stream all games live from there. Visionary iGaming casinos offer a range of games featuring human dealers and real gaming tables that are then streamed to gamblers in real time using HD video technology. Players can place bets using their keyboard and mouse or mobile device, and then the dealers actually play out the cards or spin the roulette wheel in real time. In short, what Visionary iGaming offers is the authentic casino experience streamed to your computer. However, Visionary iGaming does not deal with players directly; the company works with casino operators to integrate its games on their existing platforms. Visionary iGaming has grown in the years since it was established and now employs more than 100 people and deals hands to more than 25,000 customers each month with more than €1.2 billion in real money wagers handled every year. In addition to supplying live dealer games to online casinos, Visionary iGaming also works with land-based casinos to extend their real money games to customers either on-premises or online. With this setup, land-based casinos can take bets remotely for games that are running in the real world and even while those games are serving other customers. For example, if local legislation permits, you would be able to watch a real blackjack game in action at your local casino and even place bets on that game over the internet. Most casino sites contract with Visionary iGaming to handle their live dealer games, but the company also offers casino turnkey solutions that include digital online games, live dealer games and a complete back office platform that can be used to manage player accounts, process payments, run an affiliate program and take care of all the other day-to-day business involved in running an online casino. Visionary iGaming has partnered with several other software developers in order to offer digital games should an operator need more than just live dealer games. Two of its primary partners include Betsoft Gaming and Pragmatic Play. The three main games offered by Visionary iGaming are blackjack, roulette and baccarat with each game available in multiple variations. The dealers primarily speak English and Spanish, although the company website explains that “practically every language and currency” is supported. With plenty of dealers on hand and support of a wide range of currencies, Visionary iGaming has made itself accessible to players in all parts of the world. The software interface is simple and efficient across all games – players should have no trouble figuring out how to place bets and make decisions. The only downside is the interface looks a bit dated compared to some of the more modern live dealer games that I’ve played at European casino sites, but this probably just me nitpicking – the games look and run fine. All live dealer games are produced in HTML5 which means no download is necessary. All you need is a browser and you’ll get the full casino experience no matter which device you use. These games are equally compatible on PCs, Macs, smartphones and tablets. The dealers have always been friendly and professional in my experience. 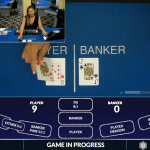 An integrated chat window allows players to chat with one another and with the dealers who respond to players by simply talking into the camera. Every time I’ve taken a seat at a Visionary iGaming table, the dealer has greeted me by username. Now, let’s take a look at each game. The live dealer blackjack tables seat seven players and support back-betting for an unlimited number of additional players (this means if all tables are full, you can still log in and bet on other players’ hands). The “choose ahead” option allows everyone at the table to select their decisions as soon as the cards have been dealt and before it is their turn. This feature simply helps to keep the games running quickly. Blackjack tables also have two optional side bets that you can place for additional action. The pair bet pays 11:1 and pays out if your first two cards are a pair. The table also offers a tip-bet feature in which you can place a bet for the dealer if you feel the dealer has been treating you well. You should also check to see if your casino site offers a variation called “Live Blackjack Early Payout.” This game allows players to back out of the hand at any point and receive a payout that could be greater than or less than the original bet depending on the dealer’s up-card. Visionary iGaming boasts that this is the highest paying blackjack game on the internet with a 99.5% payout rate when played with optimal strategy. Finally, all Visionary iGaming blackjack tables have a disconnection feature which is activated if you are disconnected from the game or fail to make a decision in your allotted time for any reason. In that event, your hand will be played automatically according to basic optimal blackjack strategy. Visionary iGaming offers both European and American roulette. Both games are identical other than the American version having a higher house advantage. If you visit a live dealer casino that offers both, go with the European roulette wheel every time to make the most of your money. 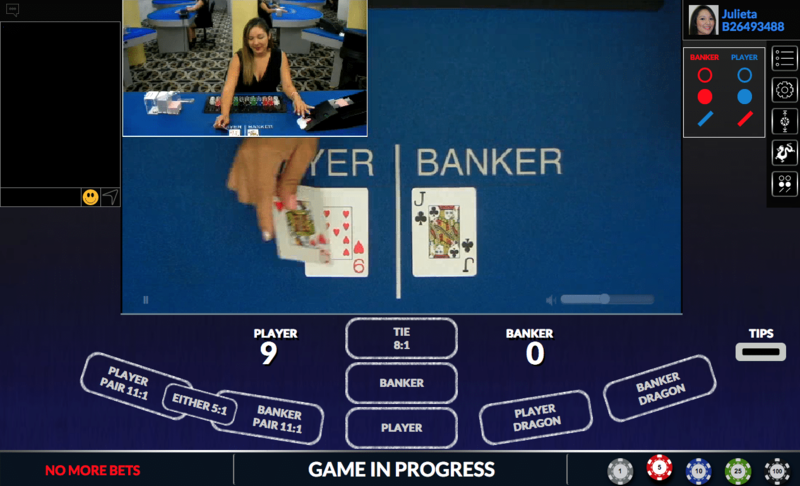 Each round begins with videos of the dealer and roulette wheel occupying the top half of the screen and a digital representation of the betting area displayed across the bottom half. You place your bets on the digital representation and then the dealer will record the bets, spin the wheel and drop the ball. After the ball is dropped into the spinning wheel, the video changes perspectives to give you a close-up view of the actual roulette wheel from above so you can watch the ball jump and spin around and eventually come to a stop in one of the slots. You can see for yourself the results in real time to know the game is legit. You can find both traditional baccarat as well as Super 6 at Visionary iGaming casinos. Both variations use standard-sized playing cards and show the dealer managing the cards in real time throughout each round of play. 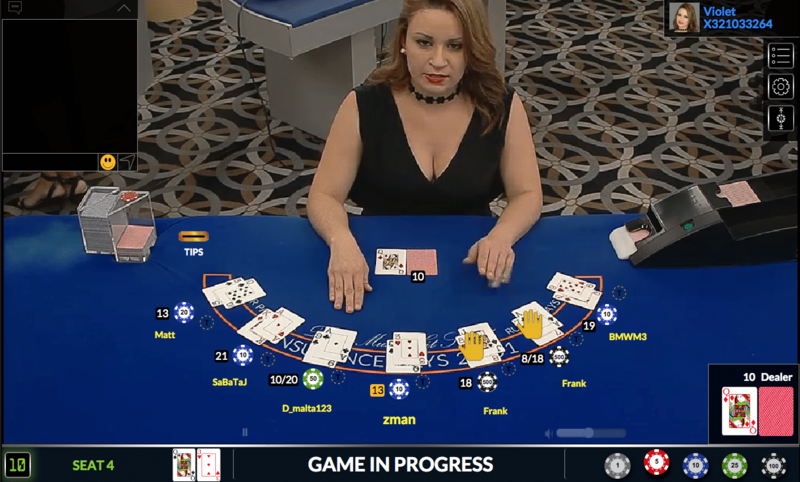 Multiple camera angles show both the dealer from a distance as well as live feeds of the cards up close from above so you can confirm every card with your own eyes. Some Visionary iGaming casino sites also offer a Live Super 6 variant which is sometimes also called “no commission baccarat.” This game pays full even money on both player and banker wins with one exception: if the banker wins with a 6, the payout is changed to 1:2 (i.e. the payout is equal to half the original bet). Ties in Super 6 pay 8:1.